Cool blue swimming pools, bubbling warm hot tubs, relaxing spas and world-class restaurants are just a few of the amenities that make a resort an alluring way to spend your vacation. Vancouver resorts offer the perfect escape from a day out on the slopes, or a busy afternoon of shopping and buzzing around the city. 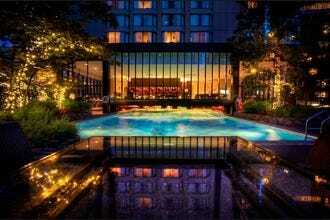 The Fairmont Pacific Rim has a luxurious spa, complete with outdoor hot tubs and comfortable lounge areas (with amazing views) that you'll likely never want to leave. After a day at the spa, head down to The Lobby Lounge and RawBar for live music and incredibly fresh sushi. The Westin Bayshore is right by Stanley Park, and the Seawall is literally at your doorstep. When you're not exploring the city and the park, lounge by the large outdoor pool that overlooks the harbor. If you want gambling, swimming and pampering all under one roof, head to The River Rock Casino Resort in Richmond. This resort is just a short drive outside of Vancouver and easily accessible by public transportation, which makes it easy to enjoy the best of both worlds. The serene rooms, impeccable service, relaxing spa, gem colored pools that are great for kids and adults, make the River Rock Casino Resort great for families. L'Hermitage Hotel is just off of Robson Street and is conveniently located on top of a grocery store, Homesense, a salon and restaurant. The chic rooms and stellar views may have you never wanting to leave. The central location makes getting around the city a breeze. Geared towards extended stays, they have all of your basic needs covered so that you feel at home. In fact, don't be surprised if you don't ever want to leave. This luxury boutique hotel pulls out all the stops and will impress the most discerning travelers. Don't feel like going out? Prepare dinner in your state of the art kitchen. It's a traveling chef's dream! This 23-story hotel has sweeping views of the North Shore mountains, downtown and English Bay, the view you would like is up to you. The rooftop pool is a welcome retreat on a hot summer day and the poolside service means that you don't need to leave until the sun goes down. Relax your muscles in the hot tub while your eyes enjoy the view. The rooms are delightfully comfortable with contemporary furnishings and your mother would be pleased with just how clean everything is. Don't let its size scare you; the customer service is top-notch. Located in downtown Vancouver, it's easy to get around and see the sights from here. 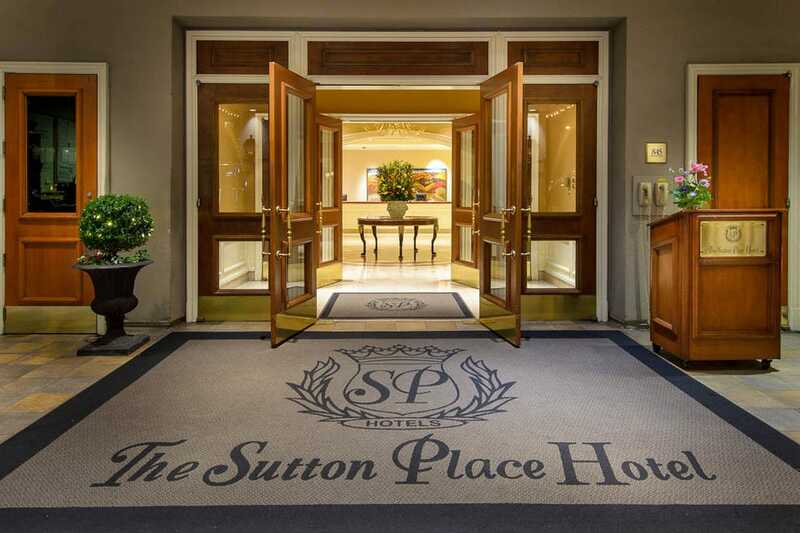 The Sutton Place is an iconic Vancouver hotel and if you don't mind splurging a bit while you're in Vancouver, it's a fantastic hotel to call home while you're here. The Sutton Place has comfy bedding, wonderful service and is in a prime location right on Burrard and Robson; it doesn't get much more downtown than that. Getting around is very easy from The Sutton Place. 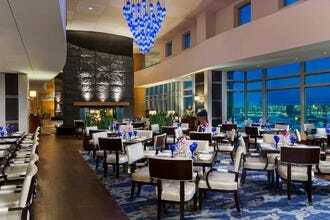 If you're hungry, make sure to check out the hotel's on-site restaurant, Boulevard. This lovely restaurant is open for breakfast, lunch and dinner. Up for a nightcap? 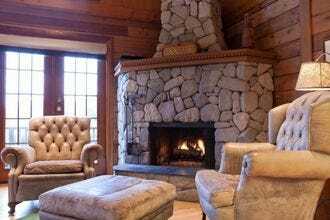 Check out the hotels lounge, the Gerard Lounge for something quiet, cozy and intimate. 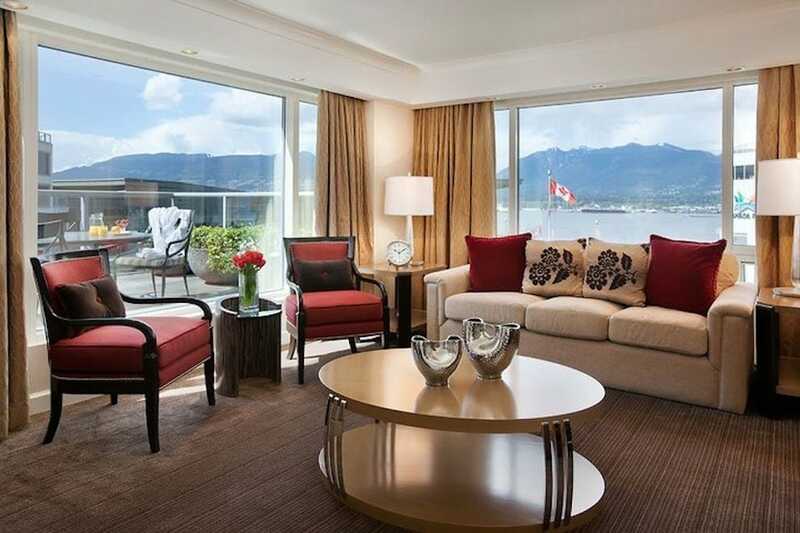 This four diamond Vancouver accommodation is connected to the Canada Place Cruise Ship Terminal and Vancouver Convention Centre. 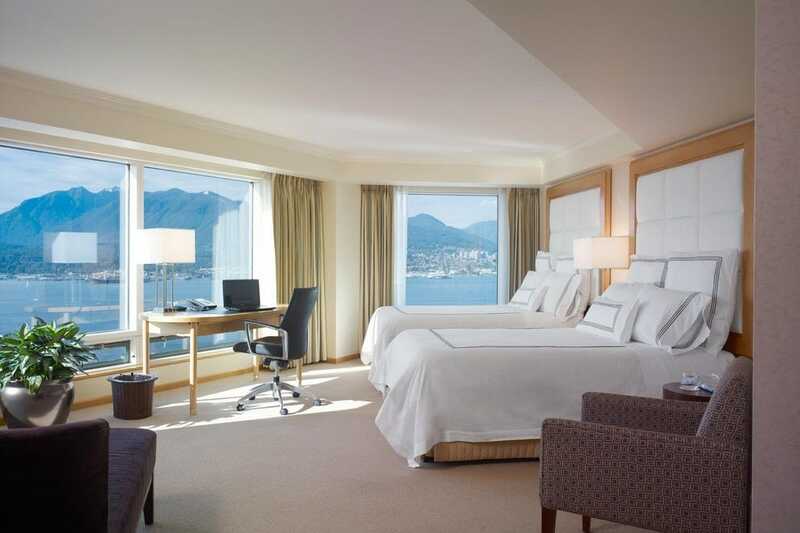 There are 489 rooms at the Fairmont Waterfront, many with floor to ceiling windows overlooking the harbor. Rooms are done in contemporary décor with flat screen TV's, and Wireless Internet Access, mini bar, safe box, iron, ironing board, telephone, and coffeemaker. Bathrooms have marble accents and hair dryers. Pets are permitted. The Fairmont Waterfront is a modern upscale property overlooking the waterfront. The hotel has a heated outdoor swimming pool, fitness zone, and sauna. There is a flower garden with a 2100 square foot Herb Garden on the third floor. 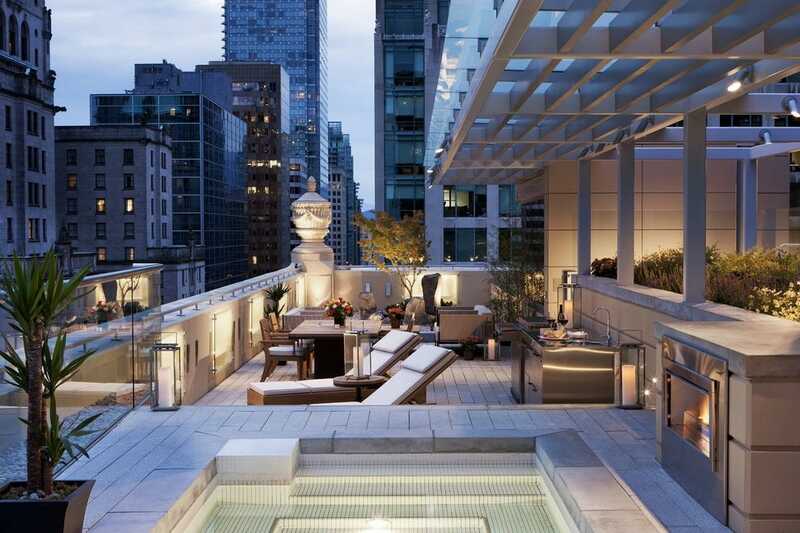 Situated in the heart of Vancouver, Rosewood Hotel Georgia is close to everything you will likely need. 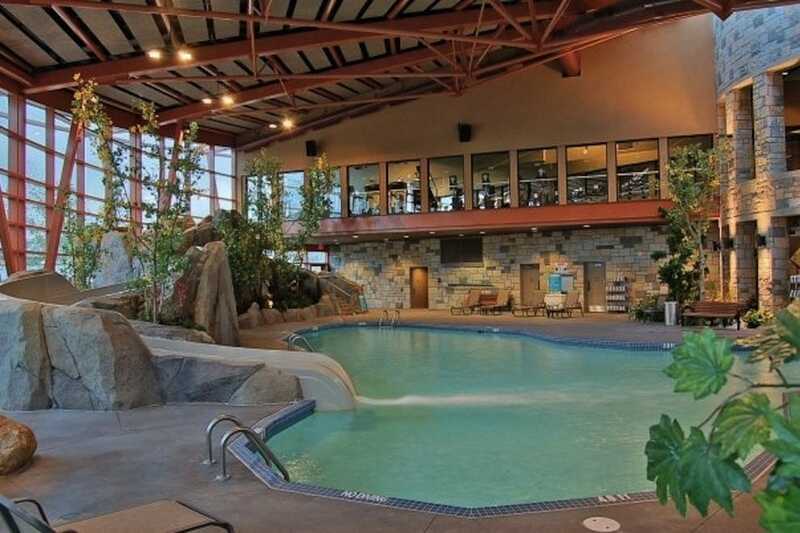 This property has a full-service spa, a health club, an indoor pool and a fitness facility. On business? Take advantage of the limo/town car service. During the 1920's, this hotel was the epitome of opulence and regal decor. In 2011 a total renovation was completed, making it once again one of the most beautiful hotels in Vancouver. 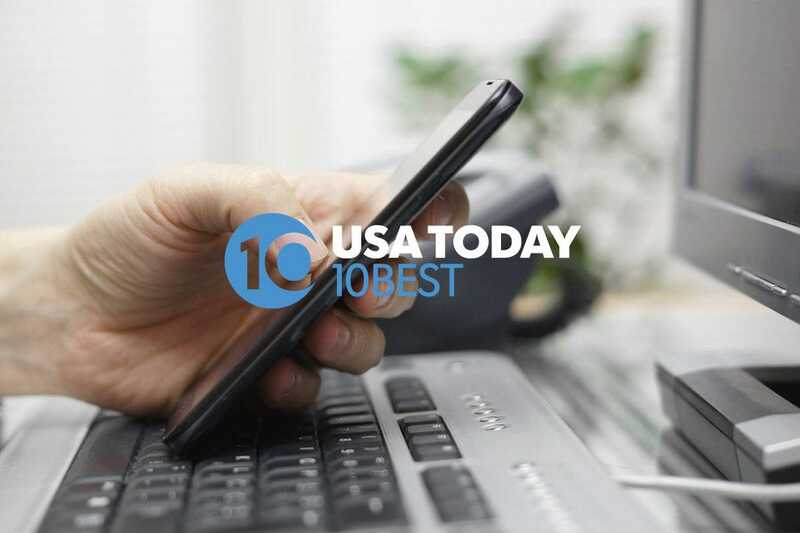 You're going to get a good night's sleep because the beds have pillowtop mattresses, Egyptian cotton linens, triple sheeting, and warm down comforters. Bathrooms include a rainfall shower, televisions, and phones. Personalize your ambiance with iPod docking stations, CD players, and climate control. If you're going to the airport, this hotel is across the street from the Canada Line and takes less than 30 minutes to get to the airport. The luxury here is worth it! The Shangri La Hotel Vancouver is eye catching from a distance, and up close. It's the city's tallest building and can be seen for miles away. 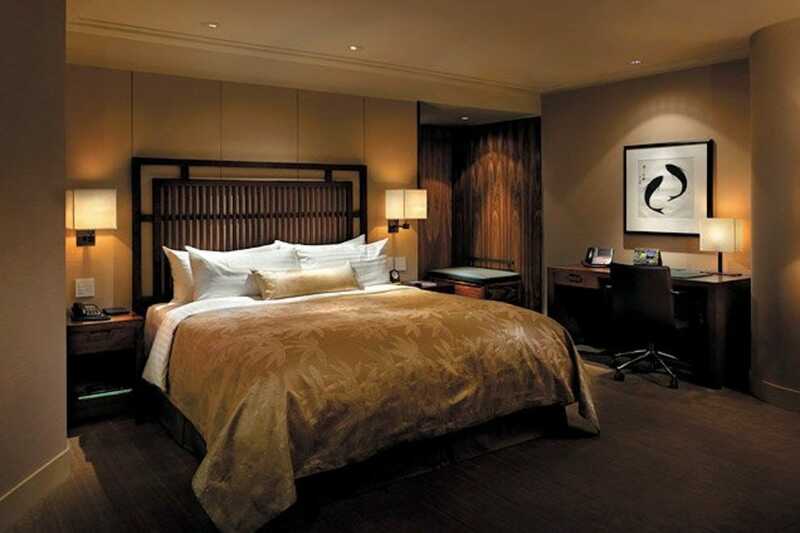 However, it's greatness must be fully appreciated from inside one of their glamorous rooms. With things like one to three bedroom suites, televisions in the bathroom mirror, a relaxing spa and a restaurant by Jean-Georges in-house, it's hard to find fault with this luxury accommodation. Jean-Georges restaurant, MARKET, is equally as fabulous as the rest of the property and makes for an ideal date night. It's central location is close to many fine restaurants, shopping and attractions. The Four Seasons Hotel Vancouver is a solid choice whether you're traveling with a solo or looking for a romantic night in the city. 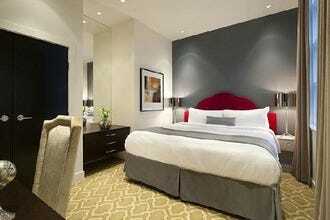 The service is impeccable, the rooms are comfortable and you're within walking distance to much of the city. This family friendly hotel will pamper guests of all ages, and welcome your four legged friends. For kids, they can get some milk and cookies, while mom and dad get a little bubbly. Everyone can enjoy the Four Seasons pampering in Vancouver. On-site guests will enjoy YEW Restaurant + Bar for breakfast, lunch and dinner and you can swim it all off in the indoor-outdoor heated pool. If you're looking for some action, the River Rock Casino Resort is the place to go. This lively property is where you'll find a casino, entertainment, restaurants, swimming and a comfy bed all under one roof. The River Rock Casino Resort Suites are luxurious and you may not want to leave to catch that flight. The Hotel at River Rock also offers comfortable and luxury rooms that will leave you rested. Stroll along the Fraser River boardwalk just outside the hotel or pamper yourself at the resort's Absolute Spa. To get to the airport, hop on the Canada Line right beside the resort and you'll be at the front door of YVR in seven minutes. Downtown Vancouver is only 18 minutes away on the Canada Line. 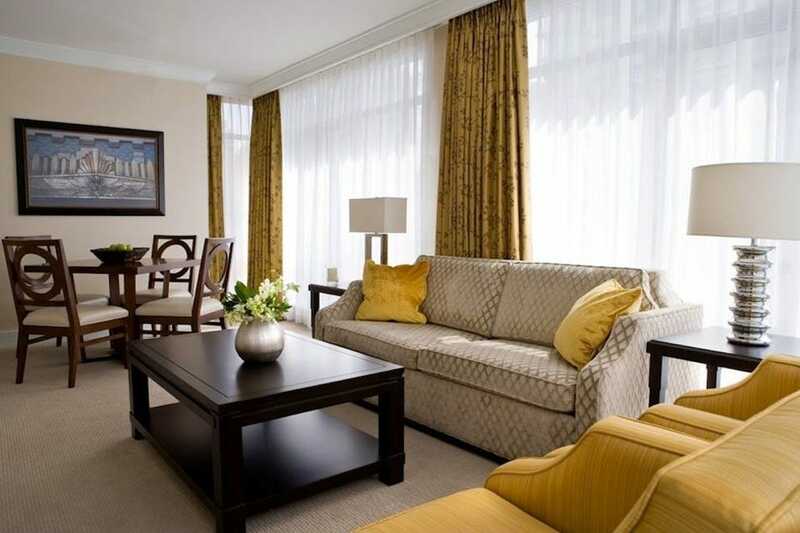 The Westin Bayshore is located in a prime location in the city. Located within a short walking distance to Stanley Park and right on Vancouver's Seawall, a multitude of adventures are right at your doorstep. 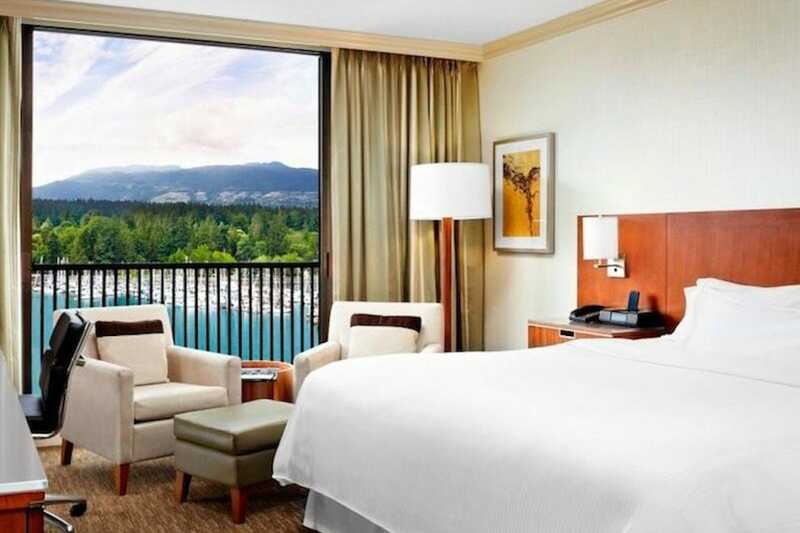 The guestrooms at the Westin Bayshore are contemporary and comfortable and some rooms are complete with balconies so that you can soak up the fresh harbour air. Fitness enthusiasts will be pleased with their state-of-the-art fitness center and both indoor and outdoor pools. On a warm, sunny day, the outdoor pool is the place to be. The hotel also includes the largest hotel ballroom in Western Canada. A full service bar and restaurant are also on site. 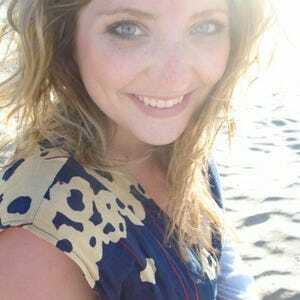 Traveling with little ones? Childcare is available at the Bayshore. 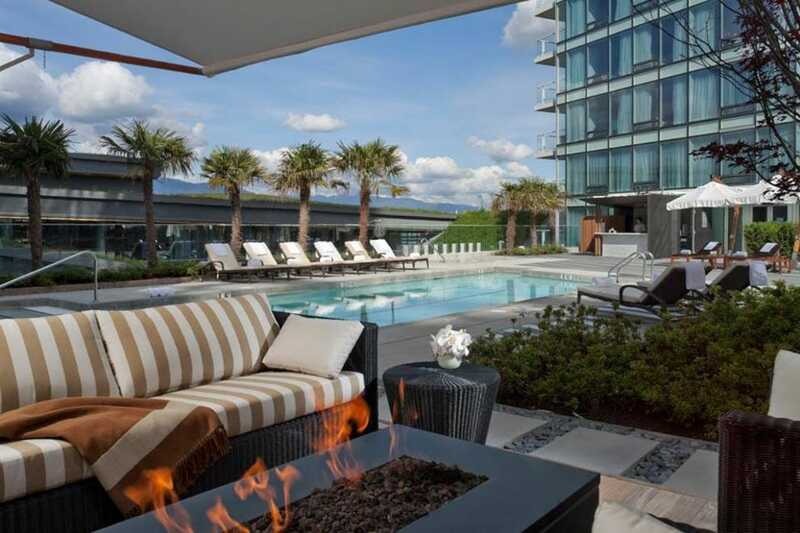 The fourth addition to the Fairmont's Vancouver family, the Pacific Rim Hotel is the edgier sibling of the bunch. With a suite dubbed the "Rock Star" suite, it's no wonder why. Overlooking the ocean and the North Shore, the view from many of the rooms is so beautiful, that you may not feel the need to leave your room to get out and explore the city. Should you want to stretch those legs and check out Vancouver, it's not a far walk to much of downtown's attractions, restaurants and shops. When the evening hits, grab a drink and some sushi at the Lobby Lounge and Terrace.